College students want many things: fun, friends, success and an opportunity to find their own way toward a fulfilling and happy life. 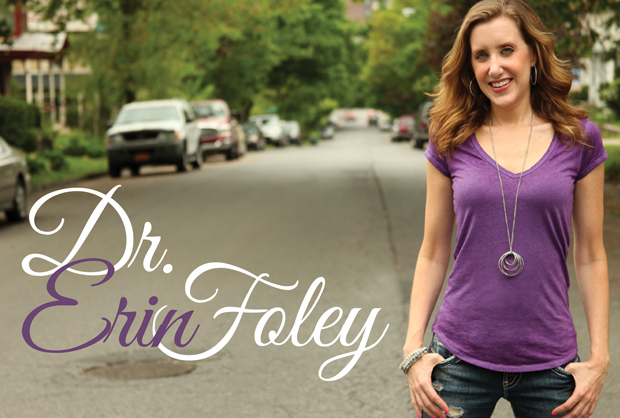 Dr. Erin Foley teaches and motivates college students on how to build a STRONG LIFE. Erin delivers messages aimed at helping students go after opportunities with strength, confidence and an eye toward what’s possible. Her messages are full of smart, practical gems that will get students moving forward confidently. As a professor, advisor and sorority alumna, Erin has merged her academic interests with her commitment and passion for student development. Dr. Erin Foley studied Communication for both her undergraduate and graduate degrees, received her PhD. in Organizational Communication and Gender Studies, and worked as a Communication Professor for many years. She is now a full-time speaker and STRONG life coach, committing her career to helping students get the most out of their college years. Both inside and outside the classroom, Erin has been a student and teacher of strong living. Her passion is in discovering and implementing daily practices that build strong, happy lives. In her downtime, Erin loves taking dance classes (jazz and hip hop), frequenting coffee shops, watching reality television and finding amazing thrift store deals. Are you living a fearless life? Are your days filled with STRONG moments that allow you to feel confident, fulfilled and free to be happy? Are you embracing the very best of what you have to offer? Today, more than ever, young women have the opportunity to create, lead and connect. Too often, they are encouraged to focus on looking for happiness and success in all the wrong places. In this empowering keynote, Erin challenges young women to look closely at the cultural beliefs surrounding femininity. She explores how these beliefs translate into daily practices and habits that often hold women back. Most importantly, Erin provides motivating and practical tips for how to rewrite beliefs and daily practices to serve women’s strengths, build their confidence, and cultivate a real sense of happiness. Erin’s unique perspective draws upon her knowledge of the research on happiness, and success in combination with her experiences as a gender professor, advisor and student mentor. But perhaps most relatable, she brings in examples of her own journey of coming into her strongest self. It is through this grounded approach, that Erin inspires young women to become the fearless females they were born to be. how to begin fostering communities that facilitate confident, connected, empowered women. As students enter their college years, they are often bombarded with information on the many available majors and minors, the dozens of clubs they can join and the multitude of resources for assistance. The recurring message that this time in their life is IMPORTANT is communicated with dizzying effects. What students are often seeking is guidance on how to channel this information in a way that empowers them to take control of their college experience. They are eager for tools that allow them to navigate this journey in a way that best serves their own unique needs. With more than a decade of experience working with college students, Erin developed Triple-S, providing new students with applicable advice on how to make a strong start and then how to make the most of these years. Specifically, she provides students with motivational and detailed information on how to embrace and take control of this time of self-discovery, how to implement stress-reduction strategies and how to uncover and move toward their own personal strengths. Drawing upon research in the field of self-discovery and strength building, Erin’s passion and experience helping students navigate their college journey provides a unique and highly engaging approach to this topic. She leaves students better able to take charge of their academic quest, their college relationships, and their future goals. Students must learn to study themselves – not just their books! It is through this keen and insightful approach of self-discovery that they are able to uncover and embrace the best of themselves and the most of their college years. how to systematically make daily choices that are geared toward building strength-based lives. Becoming an empowered young woman today can be difficult given the myriad of myths that tell women they are not enough. Cultural messages often encourage females to work against one another instead of with one another. Sorority women have a chance for tremendous self-growth at their fingertips. Sisterhood is a unique opportunity to foster meaningful and empowering relationships that enable young women to become confident, happy and healthy individuals. But, are today’s collegian members making the most of it? Are they setting themselves up for the potential benefits of sisterhood? Or, are they sometimes their sister’s worse enemy? As a Ph.D. in Communication and Gender Studies, a sorority alumna, professor, advisor, student development contributor and specialist in strength building, Erin has spent nearly a decade exploring these issues with college women. Through her work in the classroom, specialized workshops and one-on-ones with college women, she has developed a fun, humorous and motivating way to explore, debunk and rewrite the messages that hold sisters back. By taking on myths such as “your appearance is your strongest and best avenue to happiness,” Erin recognizes these limiting myths and replaces them with empowering messages and daily practices, challenging young women to create a sisterhood empowered by their individual strengths and supported by their sisters. This presentation debunks and rewrites the myths that often limit sisters from becoming their best selves, and it is the perfect keynote for any Panhellenic community building gathering. It’s also a great choice for alumnae events, new member programs or other women’s groups and events. how to practice specific strategies for living and enacting confidence from the inside out.